City Council on Thursday passed a $4.7 billion budget for the coming fiscal year that spares Philadelphia property owners a tax hike but is nevertheless expected to help the School District avoid a deficit in the near future. Mayor Kenney failed to get support for the 4.1 percent property-tax increase he initially proposed but will sign the amended budget. He said he was grateful that Council agreed with his other school-funding proposals, including hiking the real estate transfer tax and slowing down a staggered reduction in the city wage tax. Kenney frowns at Council budget — could tax hikes return? Council's plan will provide $180 million to the School District for the 2019 fiscal year that begins next month and is projected to send an additional $617 million to the district over five years. The five-year projection depends in part on continued budget cuts and the Revenue Department increasing its collection of tax delinquency. The Kenney administration said it believes Council is overestimating how much money the city can collect from tax delinquents and believes the five-year projection should be $547 million. "We would like to get the School District stabilized over five years. At this point it won't be stabilized over five years. We will be back in '21 or '22 having the same conversation," Kenney said after Council's budget passage. He had requested $770 million in new funds over five years. Council President Darrell L. Clarke said that with Council's plan, the School District will stave off a deficit until at least 2023. "We wanted to make sure there was enough revenue as far as possible" for schools, Clarke said, adding that he expects more money from the state. "It is believed that there will be some increases in school funding at the statewide level. Obviously that would put us in a much better position." 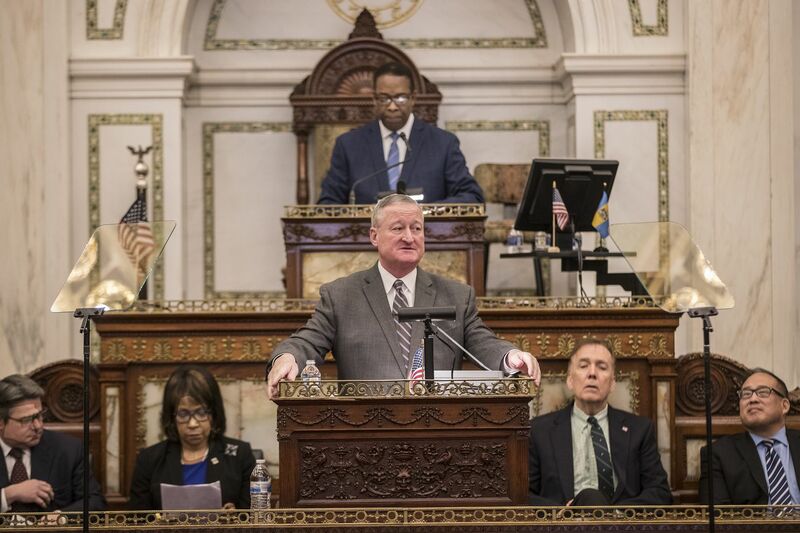 Overall, the operating budget increased spending by 6 percent from this year's budget in large part because of labor contracts negotiated by the Kenney administration but also some of the mayor's initiatives, including the fight against homelessness and the opioid epidemic. Council members also added funding to some pet projects, including for domestic-violence shelters, a reentry program, and programs to prevent gun violence. The budget passed by a 16-1 vote, with only Councilman David Oh voting against it. The approved spending plan is very similar to the amended budget presented two weeks ago that was attacked by the Kenney administration as not giving "enough" to the schools. Kenney's initial proposal, which called for more school funding, drew almost immediate backlash over his call to raise property taxes. That was pronounced because recent property reassessments across the city had hiked overall residential property values by 11 percent, already saddling many homeowners with an immediate tax increase. After enduring an earful from constituents and facing reelection next year, Council members balked at the tax increase and looked for other ways to raise money for schools. Councilwoman Cindy Bass and Councilman Allan Domb led the charge, calling for a cut in the prison department's budget. The cuts weren't as deep as they proposed — in part because of wages dictated by a new labor contract — but the final version still cuts the department's budget by about $8 million. Bass, who had been pushing for extensive budget cuts to fund city schools, was able to get an extra $3.4 million in cuts from the Streets Department, Managing Director's Office, and the Office of Innovation and Technology. "I think there is more to be done. I think this was a good starting point and I'm looking forward to continuing to have the conversation on government efficiency before we dig into taxpayer pockets," she said Thursday. "Nonetheless the main focus here is making sure that we have coverage for the Philadelphia School District, and we wanted to make sure our children are taken care of. That's been our primary focus the whole way through, and we've stepped up to the plate and done that." On Thursday, Kenney said that he likely won't ask for a property-tax increase next year. "The indication from the School District is that they won't really start worrying about their bottom line" for three or four years, he said.